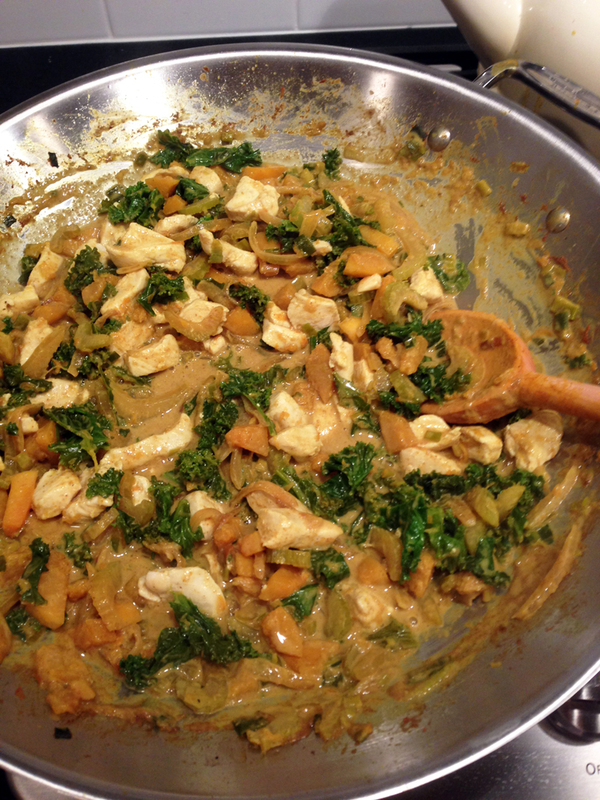 Since getting back last week from India… I mean Austin… I think I’ve had curry four times. Why am I confusing Austin and India, you ask? That was my little joke during our long weekend visit with friends, because every day involved something Indian. We were there primarily to see my friend Lauren perform in a Bollywood production – Om Shanthi. Bravo, Lauren! Maybe all that Bollywood energy stuck with us. But the next night we ended up at G’raj Mahal, an Indian restaurant near Rainey Street. And then, the following day, I found myself loading up a plate of curried cauliflower and chickpeas at the Whole Foods on Lamar, which, by the way, also thinks it’s in India – I couldn’t believe the assortment of Indian curries in the to-go food section and naan in the bread aisle. Anyway…. Usually when making curry I don’t stick to a particular recipe. I like to change it up and just go with whatever vegetables I have on hand. It’s a great “clean out the fridge” dish or if you’re shopping you can try to save a little and opt for what’s on sale. Serve over brown rice (or enjoy just by itself) add a little cilantro and BOOM! I’ve been asked if there’s a particular brand of curry powder I prefer, or if I make my own. I don’t have any regular go-to’s really, but as we’ve experimented more and more, it’s sort of fun combining my own spices rather than going off the shelf. The one in this recipe comes from a recipe provided by Dr. Amy Myers from Austin UltraHealth. If anyone out there has a brand or personal blend they swear by, please share! This recipe uses butternut squash (I found the cutest little baby one… makes me excited for fall! 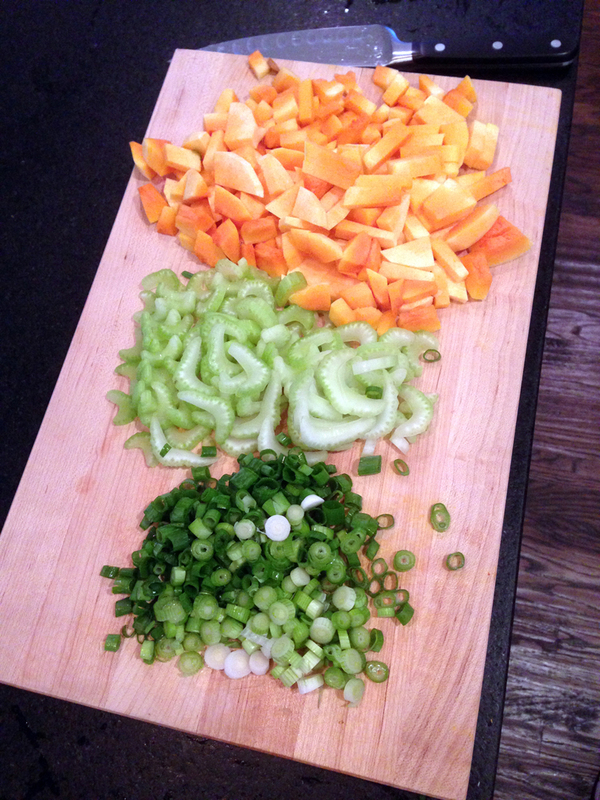 ), celery, green onions and kale. But change it up and use what you like… cauliflower, zucchini, squash, sweet potato, broccoli, carrots… the possibilities are endless. Don’t have that mix of spices? Use a prepared curry powder or paste. 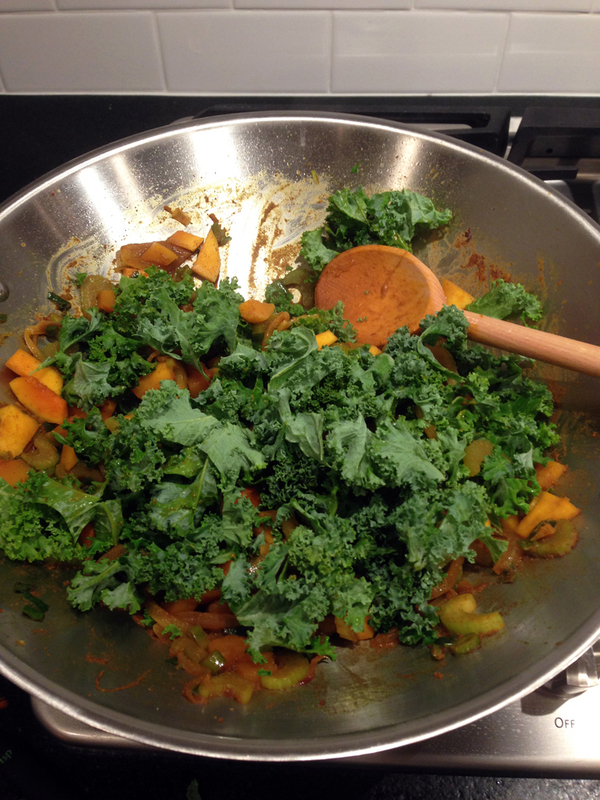 Here’s an old vegetable curry recipe from way back when that uses curry powder for another option. Heat large skillet ove medium heat and add coconut oil. When oil is hot, add onion and garlic and cook until translucent and slightly browned. Add spices and stir to coat onions. 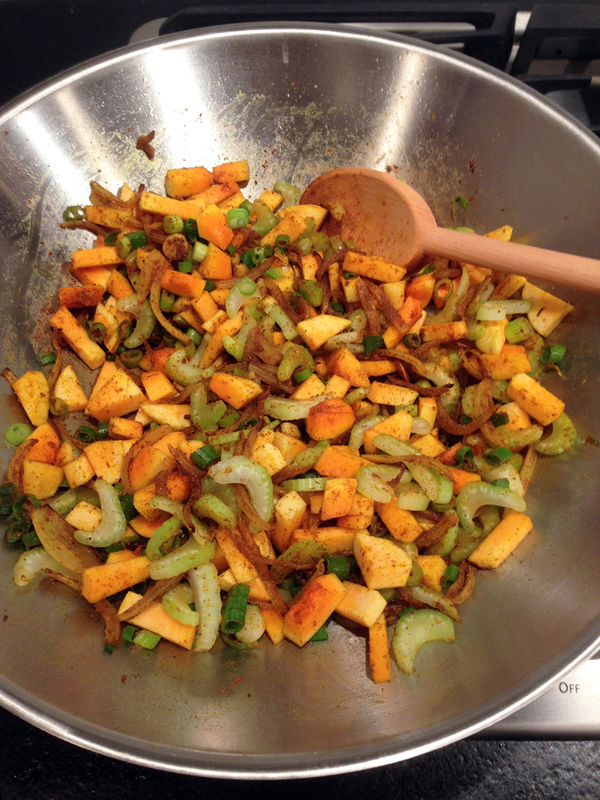 Then add squash, celery and green onions and stir to mix well. Pour in water and bring to a boil. Cook until you can pierce squash with a fork. Add kale and continue to cook until wilted. Add chicken and coconut milk and simmer to allow flavors to combine. Add black pepper to taste. Serve as is or over brown rice and topped with cilantro. How much Kale……do not see it listed under the ingredients??? Hi Clayre, sorry about that, thanks for letting me know. I added about two cups (loosely packed). Thanks for the quick reply. This is on this weeks menu so now I know to pick up some Kale. Sounds delicious!!! This recipe just follows me around.. and I am ok with that. It is suggested at the bottom when I read and I make it all the time… sooo yummy!